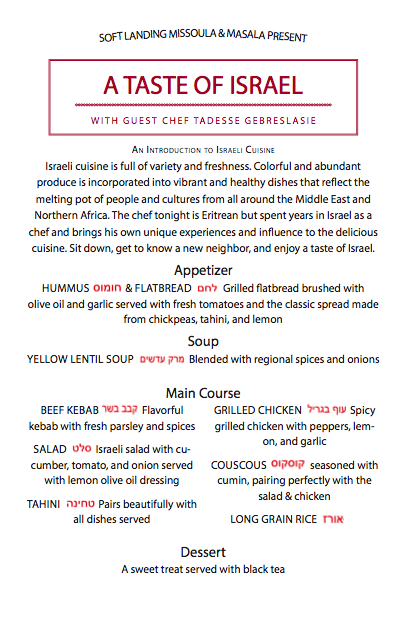 This month’s supper club will share a taste of Israel with Missoula from the experienced and talented chef Tadesse Gebreslasie! Tadesse is Eritrean, but lived in Israel for many years and worked as a chef before coming to Missoula. He brings his unique experience and influence to the Soft Landing Missoula supper club and we could not be more excited to feature his food this month! When you pay you will have the option to: Eat: $40 for a delicious family style dinner, where a portion of the cost covers ingredients and staff time, and the rest goes to the guest chef. Give: $60 gets you the same delicious dinner, but with an additional $20 going directly to the guest chef. Love: $80 gives an additional $40 directly to the guest chef to collectively make this an unforgettable evening! All levels are welcome and appreciated! How: To make a reservation call Masala @ (406) 926-6444.